The All-M is the new model Urge Bikeproducts 2012. As its name suggests, this is a helmet for practice ... All-mountain. For that combines advanced an enduro helmet with effective ventilation around a XC helmet protection. These are very large vents to optimize ventilation, the overall structure was reinforced with aluminum tubes in order to obtain safety standards and high approval. v The design is 100% new finesse and details: everyone can recognize that it is a Urge from any angle. Look Urge All-M brings a new standard of balance, fluidity and dynamism with a volume content. 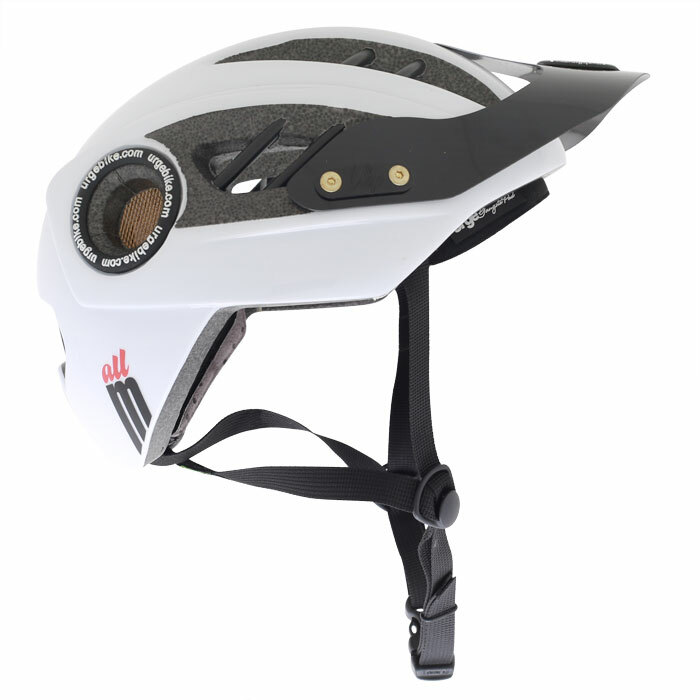 Flexible visor and lightweight, foam before "Gangsta pad" to absorb sweat trademark Urge Bikeproducts are there. Our legendary comfort is also very present and very simple system of cross straps at the neck offers as effective as any other "concept" without adding weight or maintain any mechanical problems ... Like all other models in the 2012 range, these straps are made from recycled PET. The lightness of this model (300g), its innovative look, its juicy and superior security benefits, make the All-M helmet that will attract the top riders in the top!